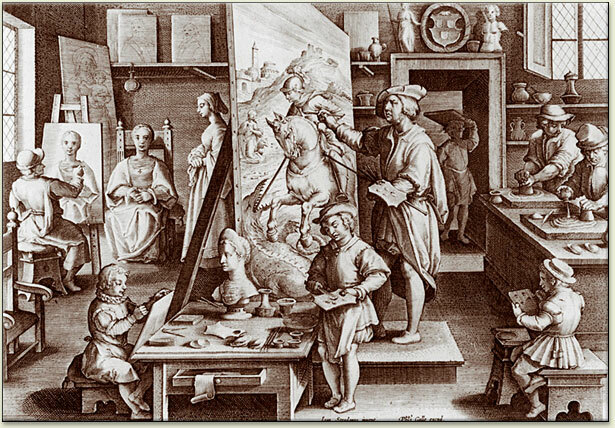 Jan van der Straet (also known as Stradanus) (Dutch, 1523 – 1604), Painter’s Studio, woodcut. As the masterpaints a large canvaswith a picture of St. George and the Dragon at the center, an apprenticepaints a portrait from a model at left, two make drawings and one mixes colors in the foreground, two more grind pigments into oil on the right, and a last one carries a canvas toward the doorway. Windows let in natural light from several angles. There are numerous shelves, drawers and tables for supplies and works -in- progress. See studio.